The Guild's iron-fisted grip on the Soulstone trade has worn Earth nations raw, creating a powder keg of alliances and enemies. Just when a world war seemed ready to erupt, horrendous creatures from a plane known as Malifaux tore their way through reality. The true battle of survival has begun. The Other Side is a game about allegiances doing battle across the Earth in a fight for supremacy and survival. Using 32mm miniatures, players will control squads of troops, powerful commanders and massive titans as they attempt to defeat their foes and seize control of Earth.. Conflict is resolved through the use of a deck of cards, allowing players more control over their own destinies. 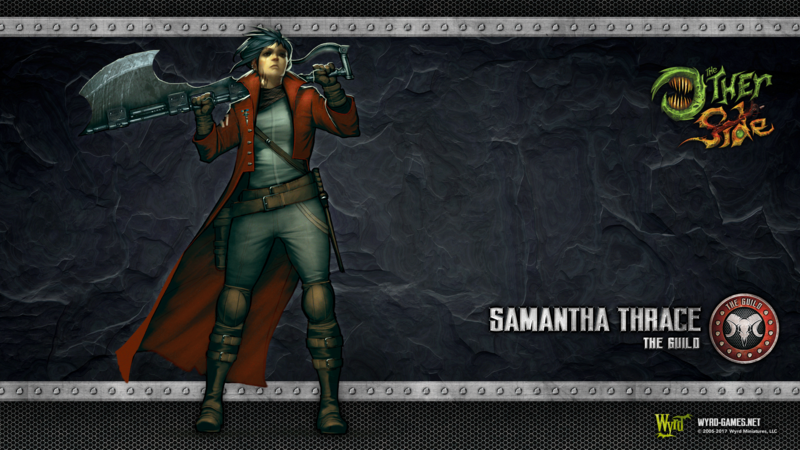 The Other Side shares a world with Malifaux, but the games are not compatible. The Other Side is a streamlined game intended to be easy to pick up and learn while still providing an exciting, tactical experience for players. The epic battles taking place across the Earth are played out on a 4 x 6 table with scattered, light terrain. Alternating activations keep you involved in the action every step of the way, while a five turn game keeps the fighting quick and bloody. The average game lasts about two hours. The Other Side is won and lost by how well your troops complete their mission (known as Operations), creating an ebb and flow to the battle as objectives are fiercely contested throughout the entire game. The Other Side takes the traditional idea of morale in wargames and turns it on its head by focusing on the inspiration that leads soldiers to greatness on the battlefield rather than the moments of panic and fear that make them break formation and flee. Every unit in the game has a stat card with two sides: its standard side and its Glory side. When certain conditions are met, units are able to flip their card over and go into Glory. While in Glory, units have better stats, better actions, and abilities that can truly turn the tide of battle in their favor! Don’t cower in fear of morale any more -- rise to greatness; rise to Glory! Battles are won and lost by more than individual troops. There are lines of supply, hovering zeppelins, and magical rituals that might have a significant impact upon the outcome of a battle. These advantages are represented by Stratagems. Stratagems are used by shrewd Commanders as the battle unfolds around them, allowing them to call in reinforcements, unleash experimental weapons, or exploit the current battlefield conditions to gain an edge over their foes. All of these gambits require you to use your valuable Tactics Tokens to unleash, however, and knowing when to take advantage of a Stratagem will be something that separates the greatest generals of the era from those that are forgotten by history. 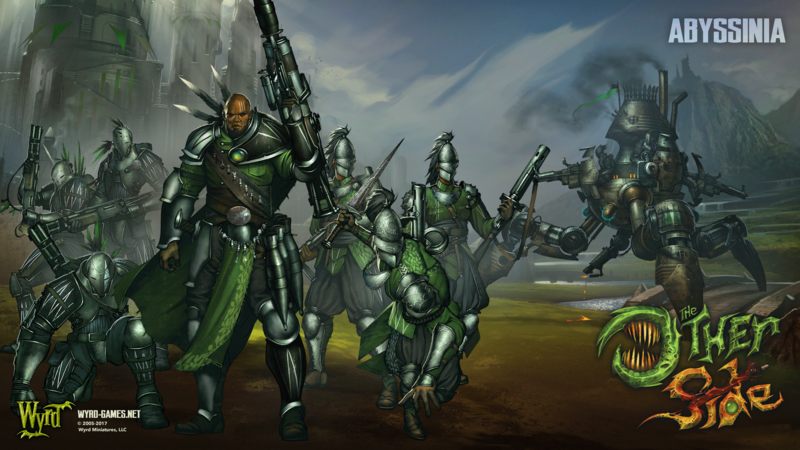 Select an Allegiance and choose which of its mighty Commanders will lead your Company into battle to defeat its foes. Commanders are able to hire troops from their loyal followers after learning their mission, ensuring that they always bring the units that are best suited to claiming victory. Those units might be Champions, highly trained warriors who bring their skill and tactical cunning to the battlefield, Squads of troops whose greatest asset is their strength of numbers, or even the colossal Titans, devastating engines of war which are capable of enduring - and unleashing - a withering amount of firepower. Below is a look at some of the components used in The Other Side. The Other Side focuses on a streamlined experience that brings the specific rules of each Allegiance and unit to the forefront with stat cards. At just a glance, you can see what your units are capable of doing, making it easier to focus on outmaneuvering your enemies. Combined with Allegiance, Asset and Stratagem cards, this puts all the information you need right at your fingertips. 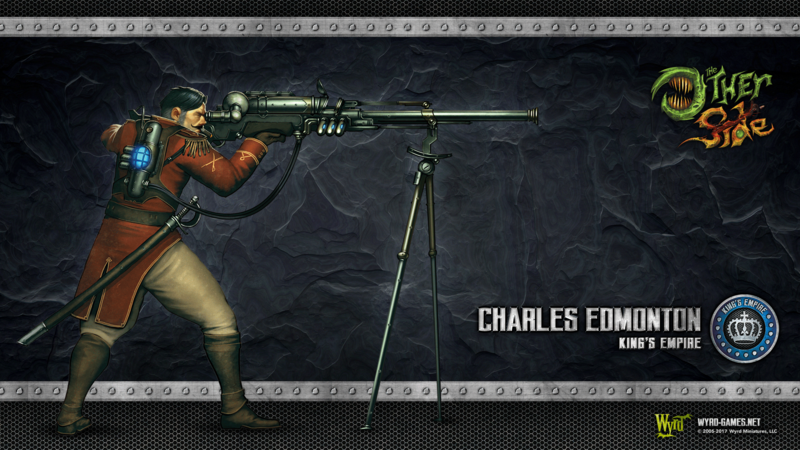 Magic, steampunk, monsters, and soldiers collide to make the battlefields of The Other Side action-packed. In order to get you into the action sooner, Every model in The Other Side will come preassembled and ready for play! The Other Side also takes advantage of movement bases that allow small groups of models - known as Fireteams - to act independently during the game, making gameplay smooth and easy despite the number of models on the table. The models in The Other Side are 32mm scale with high levels of detail, allowing painters plenty of opportunity to paint their Champions, Squads, and Titans in whatever way they wish. The Other Side uses a standard deck of cards, known as a Fate Deck, in order to resolve conflict. It’s as simple as flipping a card, adding your stat, and comparing it to a target number. The Fate Deck gives players control over their Companies in the form of the Control Hand. Cards in your Control Hand can be used to replace flipped cards, ensuring that the actions you want to succeed won’t fail at a critical moment. Say farewell to all those rolled 1s! The Other Side currently has six Allegiances, listed below. More information on these Allegiances can be found by clicking on an image below! Click on one of the symbols below to learn more about the Allegiance! Syndicates are powerful organizations that operate behind the scenes in the unfolding conflict. Selling their forces to the highest bidder, the Syndicates are able to greatly profit from the war without becoming a main part of it. In game terms, Syndicates are a special kind of Allegiance that functions like mercenaries, using the game's Envoy rule to be hired into other Allegiances that match their Syndicate type. For example, the Court of Two is a Malifaux Syndicate, so any Malifaux Allegiance (such as the Cult of the Burning Man or the Gibbering Hordes) may hire Court of Two units. CLICK ON ONE OF THE SYMBOLS BELOW TO LEARN MORE ABOUT THE SYNDICATE! For a complete list of all the products for The Other Side click the Image below.